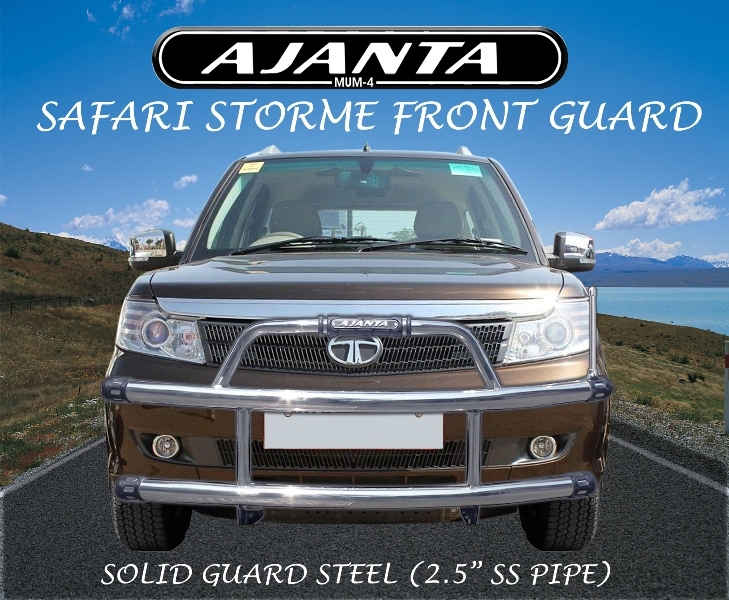 AJANTA ENTERPRISE - FRONT GUARD for SAFARI STORME TATA SAFARI STORME ACCESSORIES-------------------------------------------------------------------------------SAFFARI STORME GUARD ROBUST AJANTA ROBUST Steel Front Guard for SAFARI STORME﻿. The ROBUST﻿ Front Guard made combination of 3" inch steel pipe & mild steel breaket.﻿ We used high quality steel pipe & mild steel row matiral & ROBUST guard designed to allow your car sustain an impact without damaging the vehicle's bumper & systems. 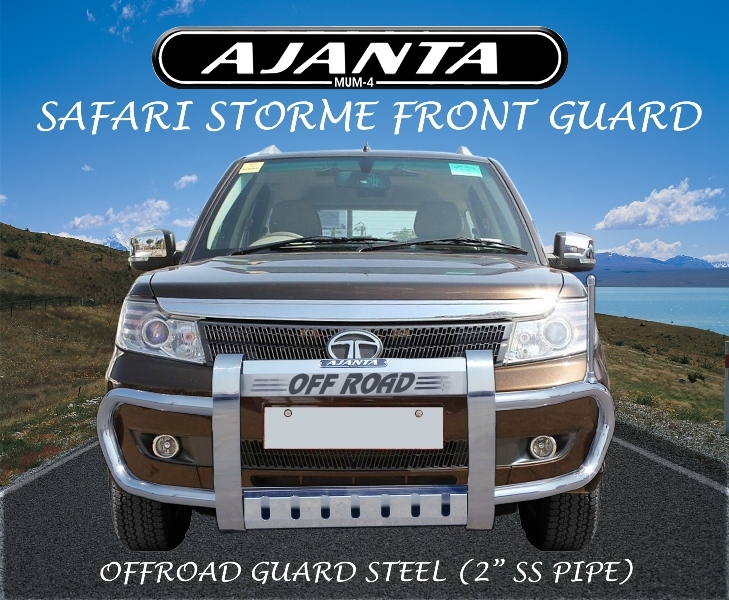 It is capable of reducing injury to vehicle occupants in high-speed impacts﻿****************************************************************﻿ SAFFARI STORME OFF ROAD GUARD AJANTA OFF ROAD Steel Front Bumper Guard for new SAFARI STORME. 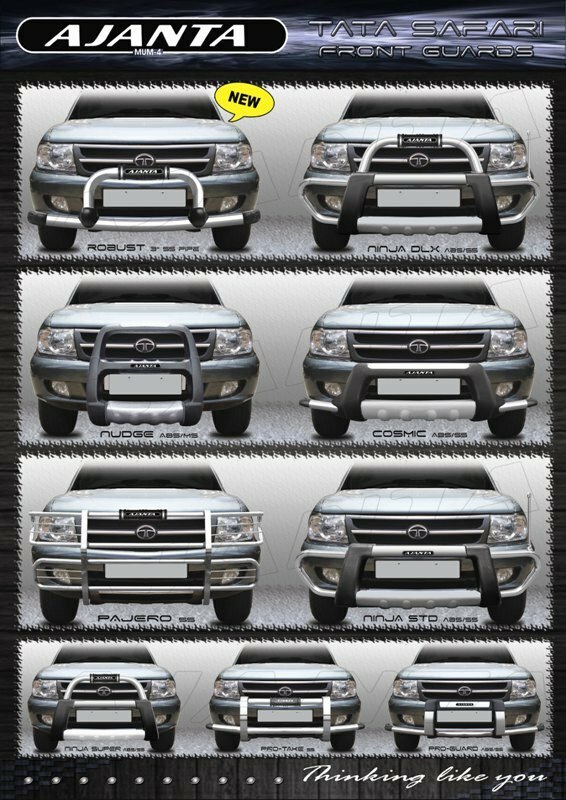 The OFF ROAD﻿﻿ Front Guard makes a combination of 2" steel pipe & mild steel frame with parking guard steel rod on left side of guard.﻿ We used high quality steel, mild steel raw matiral & SPORTS﻿﻿ guard designed to allow your car sustain an impact without damaging the vehicle's bumper & systems. It is capable of reducing injury to vehicle occupants in high-speed impacts...﻿﻿﻿﻿﻿ ************************************************* SAFARI STORME GUARD SOLID﻿ AJANTA OFF ROAD Steel Front Bumper Guard for new SAFARI STORME. 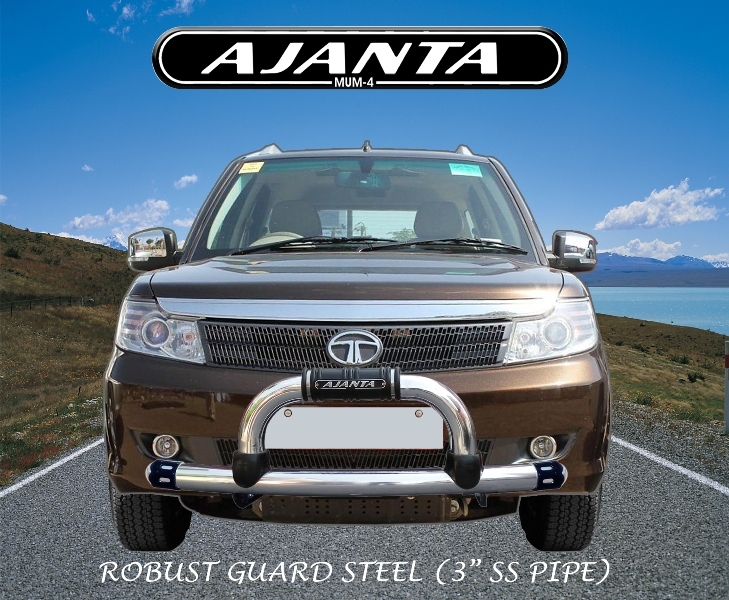 The SOLID﻿﻿ Front Guard made combination of 2.5" steel pipe & mild steel fitting breakets with parking guaid steel rod on left side of guard.﻿ We used high quality steel, mild steel row matiral & SPORTS﻿﻿ guard designed to allow your car sustain an impact without damaging the vehicle's bumper & systems. It is capable of reducing injury to vehicle occupants in high-speed impacts...﻿﻿﻿﻿﻿ *************************************************﻿SAFARI STORME GUARD NINJA-STD﻿ AJANAT Offer front bumper guards for SAFARI STORME. NINJA-STD front guards are made from combination of ABS plastic & steel pipe with mild steel frame. NINJA-STD ﻿guard with parking guaid steel rod on left side of guard.﻿ We used high quality steel, mild steel row matiral & NINJA-STD ﻿ guard designed to allow your car sustain an impact without damaging the vehicle's bumper & systems. 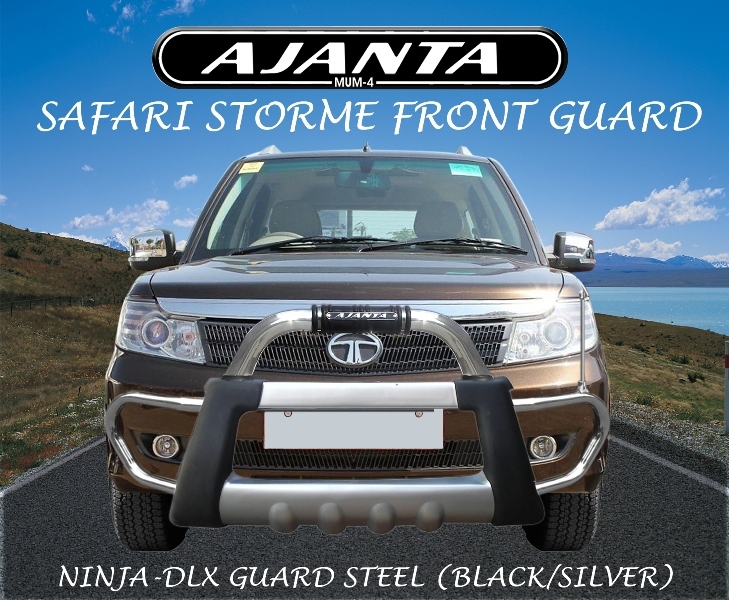 It is capable of reducing injury to vehicle occupants in high-speed impacts...﻿﻿﻿﻿﻿﻿(AVAILABLE BODY COLOUR)﻿﻿ ************************************************************﻿ SAFARI STORME GUARD NINJA-DLX﻿ ﻿AJANAT Offer front bumper guards for SAFARI STORME. NINJA-DLX front guards are made from combination of ABS plastic & steel pipe with mild steel frame. NINJA-DLX ﻿guard with parking guaid steel rod on left side of guard.﻿ We used high quality steel, mild steel row matiral & NINJA-DLX ﻿ guard designed to allow your car sustain an impact without damaging the vehicle's bumper & systems. It is capable of reducing injury to vehicle occupants in high-speed impacts...﻿﻿﻿﻿﻿﻿(AVAILABLE BODY COLOUR)﻿﻿ ************************************************************﻿ AJANTA SUMO GRANDE FRONT GUARDS AJANTA manufacture a wide range of accessories for SUV & small Cars. We have an exclusive range of front guards for TATA SUMO GRANDY in combination of (mild Steel)MS/SS, Steel and Frp, Steel and ABS Plastic and ABS/SS combination. These front guards are specially developed not only to save your vehicle but also to give an exquisite look for it. Some of these Abs and Frp guards are available in body matching colour. These guards are developed such, that no drilling is required for its fitment. We try to make it the best in rates. Our range is manufactured as per the latest trends of the market. 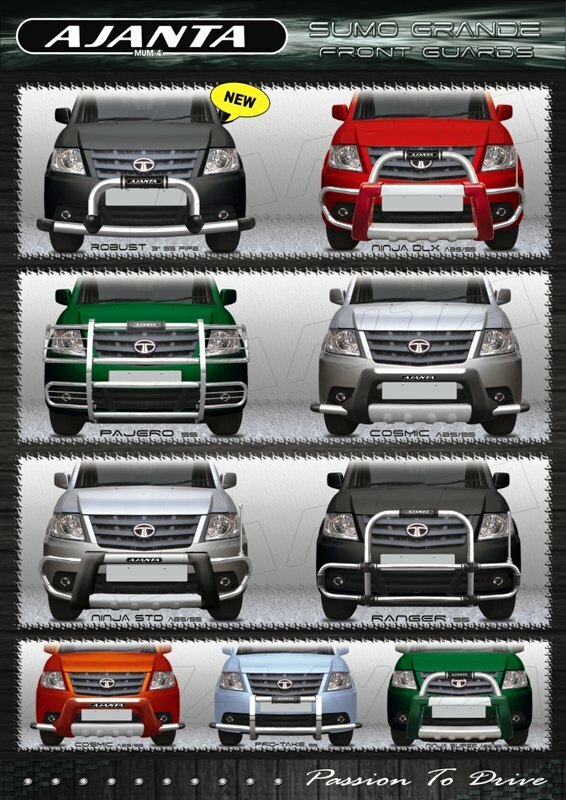 ************************************************************** TATA SAFARI/DICOR GUARD AJANTA manufacture a wide range of accessories for SUV & small Cars. We have an exclusive range of front guards TATA SAFRI in combination of (mild Steel)MS/SS, Steel and Frp, Steel and ABS Plastic and ABS/SS combination. These front guards are specially developed not only to save your vehicle but also to give an exquisite look for it. Some of these Abs and Frp guards are available in body matching colour. These guards are developed such, that no drilling is required for its fitment. We try to make it the best in rates. Our range is manufactured as per the latest trends of the market. AJANTA manufacture a wide range of accessories for SUV & small Cars. We have an exclusive range of front guards for TATA SUMO GRANDY in combination of (mild Steel)MS/SS, Steel and Frp, Steel and ABS Plastic and ABS/SS combination. These front guards are specially developed not only to save your vehicle but also to give an exquisite look for it. Some of these Abs and Frp guards are available in body matching colour. These guards are developed such, that no drilling is required for its fitment. We try to make it the best in rates. Our range is manufactured as per the latest trends of the market. AJANTA manufacture a wide range of accessories for SUV & small Cars. We have an exclusive range of front guards TATA SAFRI in combination of (mild Steel)MS/SS, Steel and Frp, Steel and ABS Plastic and ABS/SS combination. These front guards are specially developed not only to save your vehicle but also to give an exquisite look for it. Some of these Abs and Frp guards are available in body matching colour. These guards are developed such, that no drilling is required for its fitment. We try to make it the best in rates. Our range is manufactured as per the latest trends of the market.